Over the course of the visit I ate my fair share of these brownies. We took the leftovers home with us and made them even more ridiculously indulgent by serving them sundae style with ice cream and chocolate syrup. There was no brownie left behind. 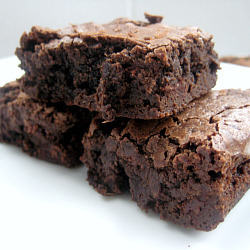 All brownie lovers must try this recipe – even if you usually rely on boxed mixes. 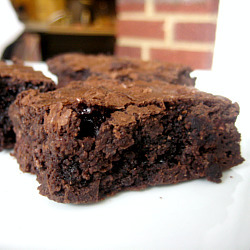 They are truly outstanding and will put any boxed brownie mix to shame. 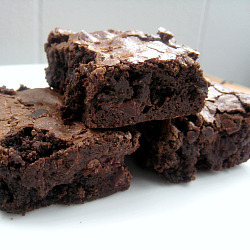 I will admit that I used to use boxed brownie mixes until I realized several years ago how easy homemade brownies are and produce far tastier results. They are so worth the little bit of extra effort required! Adjust oven rack to lower-middle position and preheat oven to 350 degrees. Spray an 8-inch square baking pan with nonstick cooking spray. Fold two 12-inch pieces of foil lengthwise so that they measure 7 inches wide. Fit one sheet in bottom of greased pan, pushing it into corners and up sides of pan. Fit the second sheet in pan in same manner, perpendicular to first sheet. Spray foil with nonstick cooking spray. The foil overhangs will help you lift the brownies out of the pan. Place a medium heatproof bowl over a pan of almost-simmering water. Melt chocolates and butter, stirring occasionally until mixture is smooth. Whisk in cocoa until smooth. Set aside to cool slightly. Alternatively, you can melt chocolates and butter in a microwave safe bowl. Cook on 50 percent power, stopping to stir ever 30 seconds, until mixture is smooth. In a separate medium bowl, whisk together eggs, sugar, vanilla and salt until combined, about 15 seconds. Whisk warm chocolate mixture into egg mixture; then stir in flour with wooden spoon until just combined. Pour mixture into prepared pan, spread into corners and level surface with rubber spatula. Bake until slightly puffed and toothpick inserted in center comes out with a small amount of sticky crumbs clinging to it, 35 to 40 minutes. I can’t think of a better way to kick-off 68 Days of Gourmet than with these Rocky Road Brownies. Last week I was really craving a sweet treat for dessert and more specifically, something that would taste great topped with ice cream. I thought brownies would meet my requirements perfectly. I was going to make a basic fudge brownie recipe but then I spotted these Rocky Road Brownies and abandoned my plans for simplicity. The base layer really is similar to your basic fudge brownie but the topping is what really packs a punch. I personally love marshmallows so these were fabulous to me. Very chocolately and indulgent – especially topped with a scoop of ice cream! Preheat oven to 350 degrees. Grease and flour a 9-inch square baking pan. In a heavy 1 1/2-quart saucepan over low heat, melt butter, unsweetened chocolate and 2 ounces of bittersweet chocolate. Stir constantly until smooth. Remove pan from heat and cool mixture for about 10 minutes. Stir in sugar and then add eggs 1 at a time, beating well with a wooden spoon after each addition. The mixture should look glossy and smooth. Add in flour and salt and stir until just combined. Reserve 1/2 cup of the batter in a separate bowl. Spread remaining batter evenly in pan and bake on middle rack of oven for 20 minutes. While bottom layer is baking, stir walnuts, marshmallows and remaining 2 ounces of bittersweet chocolate into reserved batter. Remove pan from oven and spoon walnut-marshmallow mixture evenly over partially baked layer. 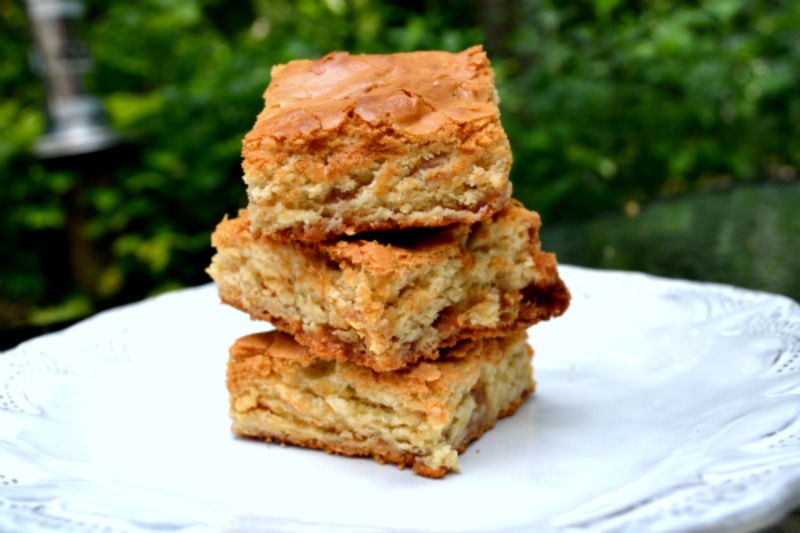 Bake for an additional 7-10 minutes, or until marshmallows are golden. Cool completely in pan on a rack before cutting. Layer brownies between sheets of wax paper in Tupperware and store at room temperature. They will stay fresh for several days.